OK, how many times have you seen a great movie and because the movie was so good you get excited when you see that the sequel is coming out. You start to remember how you felt when you saw the original movie and sometimes even get an adrenaline rush when you think about how great it will be. You think about how the sequel should go and how great it should be. You work yourself up for the movie and when you see it you are let down i.e. The Matrix and it's sequels. Sometimes the sequel may even ruin the luster of the original movie. The Brett Favre of today is the sequel of the Brett Favre in his prime during the 1990s. He is one of the best QBs of his generation and carried the Packers on his back during his prime. The Packer teams were mediocre teams during this era with running backs that were pretty forgettable (as evidenced by their inability to perform outside of GB), and the defenses were decent. However, they had a star at QB that carried them with him to greatness. He was gifted with mobility, toughness, and a rocket arm that he used to force balls into tight coverage. However, with his age, he has lost some of his mobility, he has been hurt recently, and the arm clearly isn't the rocket that it once was. I think when the Vikings look at Brett Favre they get that same adrenaline rush that I would about a sequel to a great movie. They are hoping for the "original" Favre and they think about how this season should go with him on their team. Only time will tell if they will get a rare sequel that is as good or better than the original. Even if he is successful this year, I think his indecision regarding retirement has ruined a bit of the luster of the original Brett Favre. Now, with that being said, I do like Brett Favre and I'm not nearly as harsh on him as most others are. I acknowledge that he makes poor decisions and that he throws a lot of interceptions but I also think he has a lot of intangibles that great QBs have. He is a leader and teams love to go to battle with him. I thought he took a lot of flack in 2007 when in reality he had a terrible team around him with injuries etc. In 2008 he almost lead the Packers to the super bowl losing in the NFC championship game and had one of his best years. Last year before he got hurt he played quite well. I don't know how well his arm has healed but if it is fully healed then I don't blame him for coming back. Could you turn down $25 million dollars for two years? Could you walk away from something you have done your whole life, something you love to do knowing that you will never have the opportunity to do it ever again? Could you do that at a very "real life" young age of 39? What would you do for the rest of your life? I don't know if I could walk away from it so I can't say that I blame Favre for giving it another run. Is Favre going to be the rare sequel exception that is as good or better than the original (can he take the Vikings to the Superbowl)? Do you blame him for coming back? I don't blame him for coming back but I dislike that he said he wouldn't be coming back then and conviently came back after training camp. If I were his new teammate I'd be a little angry and that is not the type of leadership I would want on my team. I think its gonna be a bad bad sequel. When I go out to eat and I find a plate that I really enjoy I don't really bother myself with how it was made. I don't care for all of this Favre talk, if he plays well I will enjoy it. In the end the proof will be found in the pudding. Is Brett Favre really Neo? 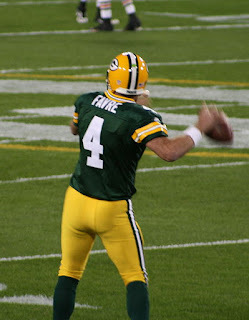 When the nature of the Vikings offense is revealed to him, will Favre (Neo) be revealed to be 'The One' to lead the Vikings to Super Bowl victory? University of Georgia graduate Fran Tarkenton got the Vikings as close as they have been to Super Bowl Champs (but almost just don't cut it). The Vikings were the first team to both play in and lose four Super Bowls. Sage Rosenfels and Tarvaris Jackson showed up at the Vikings training camp thinking they were going to compete for the starting job. Now they are battling for a roster spot. One thing is certain in the NFL, your career is always in jeopardy. I think Favre has some gas left in the tank. But if he doesn't, this will quickly become Friday the 13th part 5 for the Vikings. I've never agreed with the people who think athletes have some kind of obligation to "go out on top." If you have a true love of the game, I say go ahead and play as long as you want, no matter how much your abilities may decline. The only catch is that such athletes should be able to be honest about their own abilities, and not expect coaches to use them the same way. A great example is Jerry Rice - he played long after his prime, but he loved the sport, and he could accept not being the #1 receiver. You never heard him complaining about not getting the ball enough. If Favre loves the sport and wants to keep playing, that's his privilege. I don't think his doing so takes anything away from his accomplishments at his prime. Joseph, I think you are exactly right. When Favre announced that he was going to stay retired I turned to my friend and said, "Let's see what he says after training camp." I think he wanted to play but didn't want to go through camp. You are right, not the kind of leadership that you would like to see if you are a teammate slugging through camp. I also agree with Jonathan and think that athletes should be able to accept when their abilities have degraded and they may no longer be the "man" on the team.